If you ask me what I remember about the movie Annie, off the top of my head I’d tell you about the little red-haired girl with the dog Sandy, the songs (Who doesn’t know “Tomorrow“, “Maybe“, “I Think I’m Gonna Like it Here“, etc.) Daddy Warbucks (Who fondly reminds me of my Grandfather) and his huge huge mansion, Punjab the bodyguard (Who looked scary but since he was nice, he was alright in my book), and a lot of other singing and dancing by young and old cast members alike. They’re all happy thoughts and good things about the movie. Of course the last time I did actually watch Annie was 25 years ago. 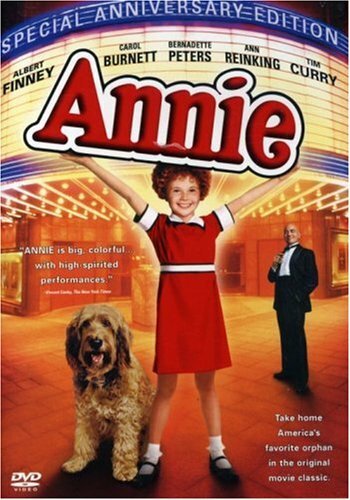 So when our DVDs from Amazon arrived, I immediately picked Annie to be Sam’s first real musical movie. She’s a young girl, Sam will like the dog and the singing and the dancing — how can one go wrong? Maybe I was just naive? As with all the shows I’ve introduced her to, I sit and watch it with her (more excited than Sam I presume), seeing the film in a new light. It only occurred to me fairly recently that Annie was set during the period of the Great Depression. Furthermore, my excitement faded into a “mommy horrified concern” when I realized Sandy was a scruffy smelly dog with FLEAS (When you’re 7 watching Annie and you want a dog, I guess that wouldn’t occur to you) – and yet Annie would kiss him and sleep beside him! Truth be told, I don’t think I’d let Sam near Sandy until AFTER his bath at Daddy Warbucks’ house, and after he’s cleared by a Vet! I also felt that parts of the plot and the scenes were a little too old for Sam. In particular, Ms. Hannigan and her constant drunken stupor, or Rooster’s attempt to kill Annie by trying to throw her off a bridge. There were other scenes which made me feel awkward for Sam to watch at such a young age, and so I tended to skip over to the shiny smiley safe parts. To add to my concern, my husband (who claims he hardly remembers watching Annie — well, that wouldn’t surprise me, since he traded off watching The Phantom of the Opera in London for a WWF fight on TV before!) caught clips of the movie while feeding Sam one afternoon, and says to me it’s the wrong decision to expose her to the film. There are kids fighting, bombs exploding, scantily-dressed criminals dancing, etc. He was concerned that Sam would pick up the wrong things from the movie. After that I decided to put a hold on the Annie-viewing first and think about it some more. I remember being exposed to Annie at an early age, but I don’t remember the “not-so-good scenes”. Why was that? Maybe the parts where the kids sing and dance are really more appealing to younger people and everything else glazes over? Or was it because of the subliminal color contrasts amongst the scenes and the characters; everyone and everything at the orphanage was dull, while everything around Mr. Warbucks was sunny and light-colored? Was that why I was attracted to the happier parts? I don’t know what it was. Then again, how different is that from Tangled where Flynn gets stabbed by Mother Gothel, or even the Red Riding Hood fatality of the wolf eating the Grandmother? Is it because these are cartoons and Annie is real life? “They’re watching a movie mom!” Simultaneously standing up and doing the “step-kick” dance routine from the song “Let’s go to the Movies”. “Annie’s drinking milk!” Okay, this one caught me by surprise — it’s the scene where Annie and Daddy Warbucks sit down with FDR at the White House. I didn’t even notice Annie’s glass of milk until Sam pointed it out. Of course, she already sings Tomorrow at the top of her lungs. Maybe she is a little too young to understand the whole plot of it all. In a way that’s a good thing, so the not-so-great scenes can still be erased from her memory. Maybe, she picks up on the things she can relate to – cleaning the house, watching a film and drinking milk for instance, and everything else glazes over. Maybe she remembers “Tomorrow” because — well, it’s Tomorrow! — Someone in our family must have sung it to her before so it might have sounded familiar. I still believe that Annie is one of our must-see, must-have classics, and Sam and Jamie will both watch it in due time. I for one am having a grand time watching it again (So the DVD was actually for me? heehee! ;)) and can appreciate it in a new context. What do you think about showing Annie to young children? Oh no, did I recommend this to you? M watched Annie right when she turned 2. She had no patience to go over the whole story so I would always skip over parts to go to the singing parts. I did the same for Mary Poppins. I’m glad I showed her Annie at that time though because when we went to Vancouver, Annie was playing at Stanley Park. She liked it at . It was her first play. When we came back home, she was excited to watch the rest of the movie but yes, she got scared of the parts where Ms. Hannigan screams, Annie is fighting and the bad people are following her up the ladder. So she hasn’t watched Annie since. haha, yes and no. I remember you mentioning M watching Annie and being Annie for halloween but it was on our list of classics to get (my list is forever growing by the way!) so yes i think i’ll just continue to skip through to the shiny happy people parts in the meantime. 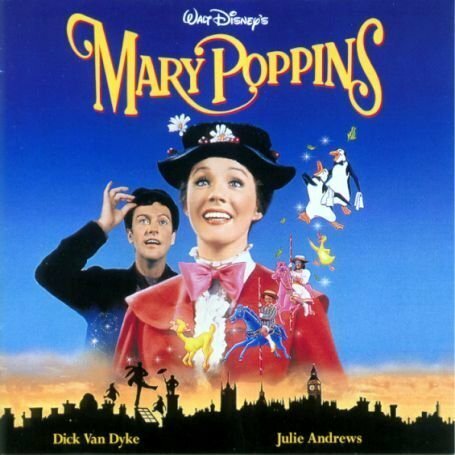 she watched Mary Poppins today for the first time and although she lost interest in several parts, she ended the day singing “chim-chiminey” and “super califragilistic…” – pronounced “supewalwaililidadudawideedee”. if you want her to watch annie i suggest the disney version. I know the old one is better and when i was a kid your daugters age i would watch the old one with no problems but if you are worried watch the disney one because its well……. DISNEY! Thanks for this! I think since I posted the post, we’ve watched it several more times… but I’m not as worried since she’s just happy about the songs and the kids and the dogs. But thanks! I’ll look up the Disney version! My daughter loves Annie, she’s under 2, and has plenty of patience for it. I have no fear showing it to her at all. Yes it’s true – even when she watches it now (a bit older), it’s still all the good stuff, so all in all, a good movie!